Wilmington staples like The Cotton Exchange, the USS North Carolina Battleship, and the 1914 Murchison Building are all located along the route, although visitors may be hard pressed to leave the scenic wooden walkway which is bordered by some of Wilmington's most prestigious buildings as well as miles of open water views. The Riverwalk, in fact, with its collection of pastel colored shops and historic structures has been the subject of numerous works of art, and several local tours, including both water and land tours, are dedicated to exploring this 1 mile area. The Riverwalk was initially envisioned as a pedestrian pathway that went from "bridge to bridge," or specifically, from the Cape Fear Memorial Bridge to the Isabel Holmes Bridge. With a couple minor gaps through the route, plans are in the works to complete the initial goal by 2016, but in the meantime, strollers can still enjoy the endless vistas and entertainment from the wide walkway. The Riverwalk itself is wooden, with heavy but unimposing concrete railings toprotect walkers from the drop to the water below, and leads through the heart of Wilmington's downtown. Popular with joggers and runners, the Riverwalk is also lighted at night with decorative hanging street posts, and also has benches and embedded stools throughout the route for visitors who want to sit down, relax, and enjoy the salty breeze. 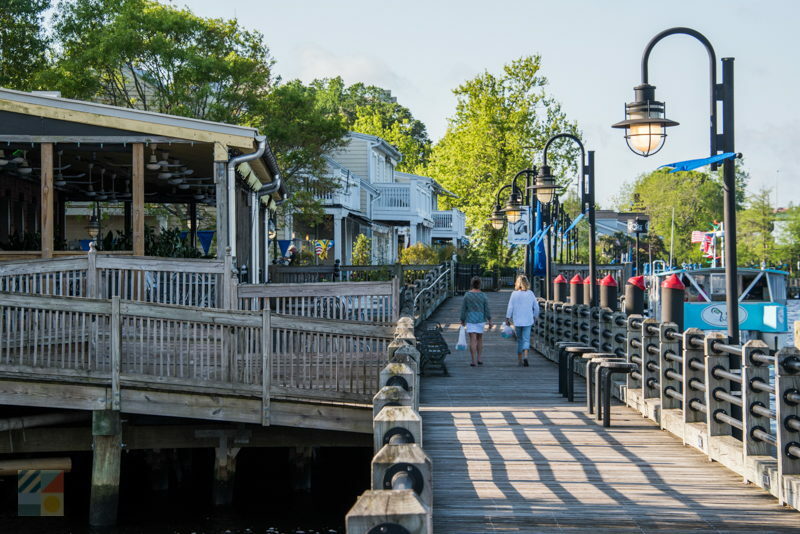 Besides the large attractions, like the impossible-to-miss USS North Carolina Battleship stationed along the docks, the Riverwalk also provides easy access to some of the downtown area's favorite shops and restaurants. Located just across the cobblestoned street, visitors can easily tour a number of local boutiques, souvenir shops, house ware stores, and even a candy store as they stroll through the town. There are also a number of local cafes, bistros, and restaurants with summertime patio seating overlooking the riverfront, which can effortlessly serve as a scenic stop to enjoy the views and a little grub before patrons continue on their way. Perhaps most impressive about the Riverwalk, however, is the number of events that are held along its borders throughout the year. On every Saturday summer morning, the streets bordering the Riverwalk are crowded with vendors from all around the coastal area, selling their fresh wares as part of the weekly Wilmington Farmer's Market. Here, shoppers can load up on fresh fruits, veggies, herbs, locally grown plants, and homemade goodies from dozens of local coastal farms and businesses. The Riverwalk region is also home to the acclaimed annual Riverfest, a local celebration that has been a Cape Fear staple for decades, and which features a full weekend of arts, food, and continuous entertainment destined to charm any visitor. Other local area events, like garden parties or seminars with the Cape Fear River Watch, avidly take place on a weekly basis, as well as the impromptu performances of local musicians, artists and performers. Perhaps the best aspect of the Riverwalk is that you never know what you will encounter en route, whether it's a local festival, or a local musician providing some harmonious background strolling music. As a community boardwalk, the Riverwalk is open 24/7, with no charge to stroll along this serene stretch of Wilmington's waterfront. With renovations and expansions an ongoing process, visitors may encounter small seasonal closures of the Riverwalk during a visit, but this in no way hinders the overall experience. 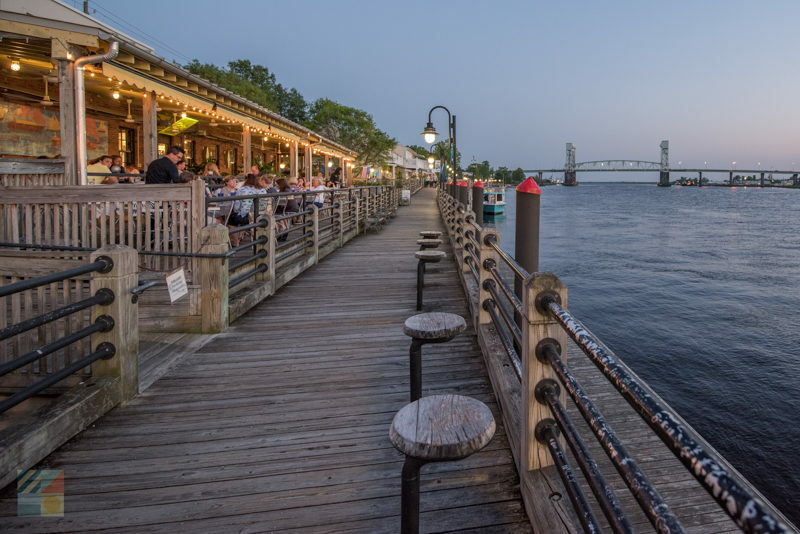 For an easy way to dive into the Wilmington scenery, while enjoying steps-away access to the local attractions, shops, and restaurants that has made the historic Downtown a distinctive destination, the Riverwalk is a must-stop for any traveler. 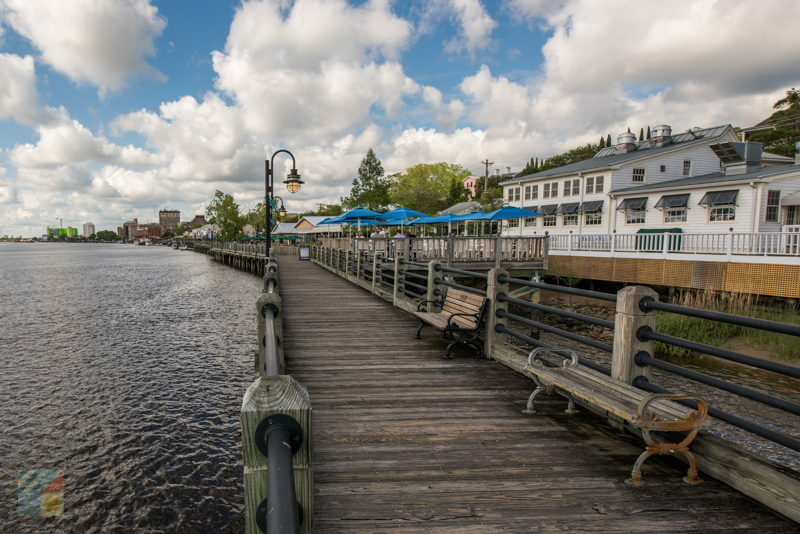 Plan an afternoon strolling down this stunning patch of Wilmington's waterfront, and enjoy a front row seat to all the action of this bustling port city, both on and off the water. Where is the Wilmington Riverwalk? 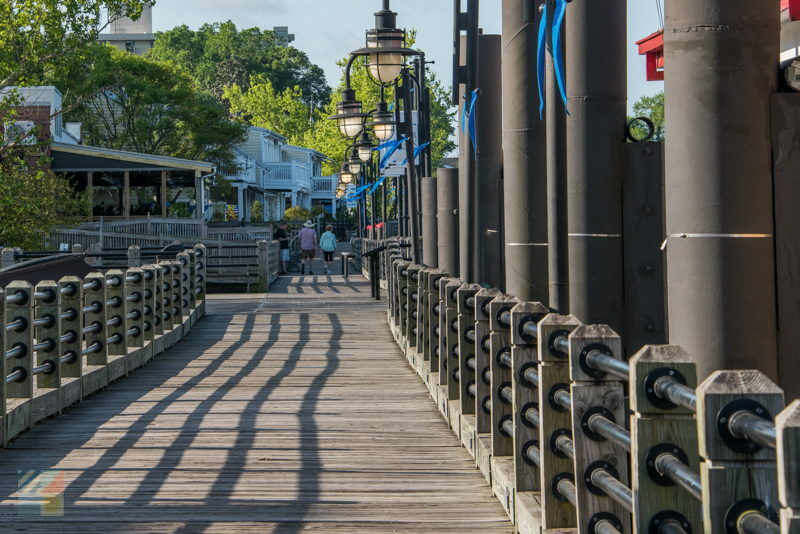 The Wilmington Riverwalk is located in the heart of downtown Wilmington, at the very edge of the Cape Fear River where the city meets the water. 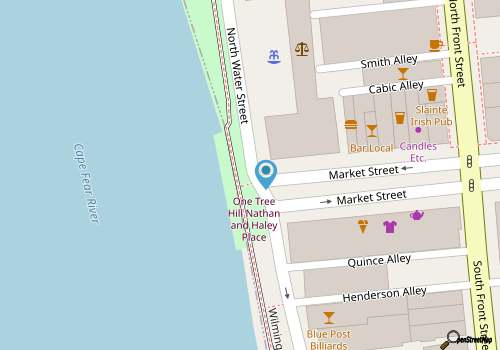 It runs parallel to Water Street and Front Street, and connects with a number of popular downtown streets as well, such as Market Street, Dock Street and Orange Street. How do you get to the Wilmington Riverwalk? Visitors exploring the downtown area will find that the Wilmington Riverwalk is fairly impossible to miss. 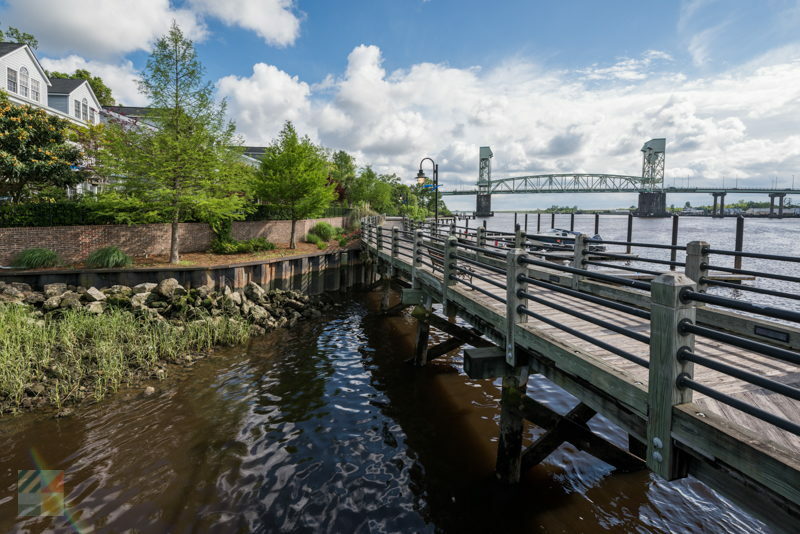 Located on the edge of the water, visitors simply need to head to the Cape Fear Riverfront to access the 1.75 mile long Wilmington Riverwalk. How long is the Wilmington Riverwalk? The Wilmington Riverwalk is 1.75 miles long, after it was completed in its entirety in November, 2017. When did the Wilmington Riverwalk open? Portions of the Wilmington Riverwalk have been open for many years, as the project has been in the works since the 1980s. However, the Wilmington Riverwalk was fully completed on November 18, 2017. How long did it take to build the Wilmington Riverwalk? The Wilmington Riverwalk project was first initiated in 1980, and the entire operation required the remodeling and / or renovation of numerous docks, marinas, and the waterfront itself. How much did the Wilmington Riverwalk cost? Since the project started in 1980, the City of Wilmington has spent more than $33 million dollars in improvements and features to the Wilmington Riverwalk, and the adjoining Cape Fear Riverfront. Are there views from the Wilmington Riverwalk? The Wilmington Riverwalk has a stellar view of the wide Cape Fear River throughout, as the walkway borders the river from start to finish. Are there benches on the Wilmington Riverwalk? The Wilmington Riverwalk features a number of benches and seating throughout, which includes porch swings, stools, and sitting areas to admire the Cape Fear River views. 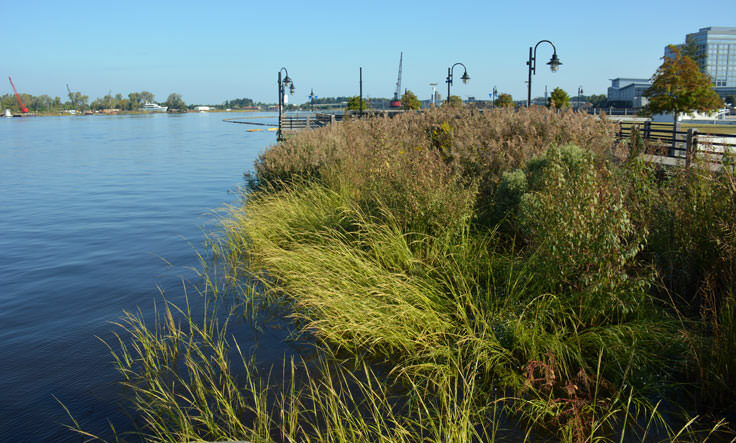 Is the Wilmington Riverwalk covered or protected from rain? The Wilmington Riverwalk is not covered or protected from the elements, however, there are gazebos and covered areas at area restaurants and parks, such as Riverfront Park. What attractions are near the Wilmington Riverwalk? 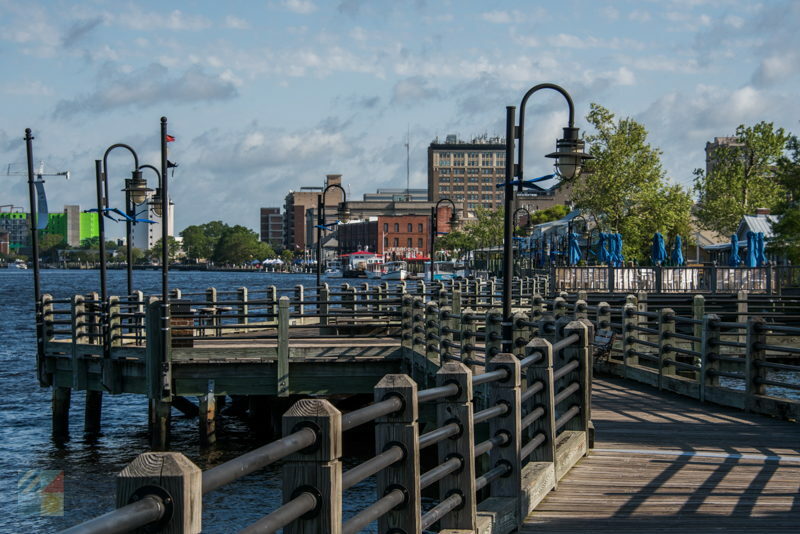 The Wilmington Riverwalk is steps away from a wide array of downtown attractions. Famed Wilmington landmarks that are either on or within a couple blocks of the Riverwalk include the USS Battleship North Carolina, The Cotton Exchange, the Museum or the Bizarre, the Children’s Museum of Wilmington, Thalian Hall, and Riverfront Park. Is there a park along the Wilmington Riverwalk? The Wilmington Riverwalk cruises by a small park known as the Riverfront Park, which is located on the edge of the Cape Fear River, and which features benches, planters and a fountain, restrooms, and picnic tables. Is there a picnic area along the Wilmington Riverwalk? A small picnic area with tables is located within the Riverfront Park, which is adjacent to the Wilmington Riverwalk. Are there restrooms along the Wilmington Riverwalk? 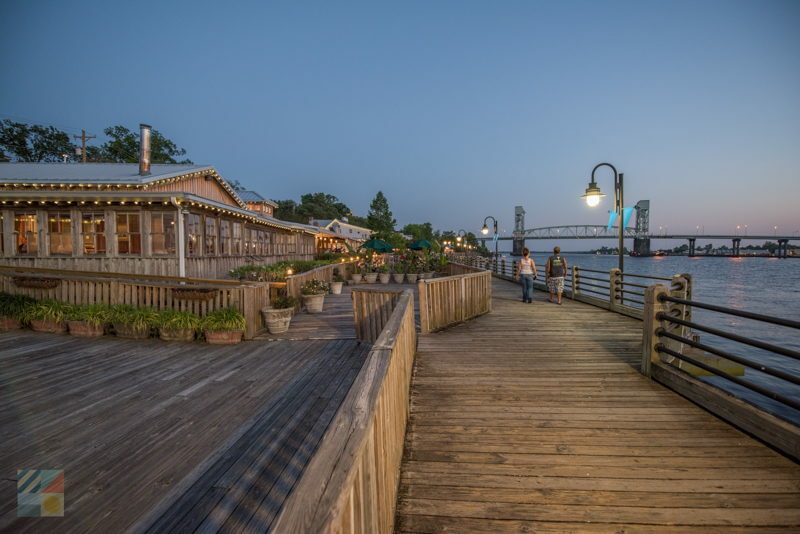 Many area attractions, restaurants and shops that are steps away from the Wilmington Riverwalk feature restrooms for customers and / or visitors. In addition, public restrooms are located at Riverfront Park, which is situated along the Wilmington Riverwalk. Are there restaurants near the Wilmington Riverwalk? 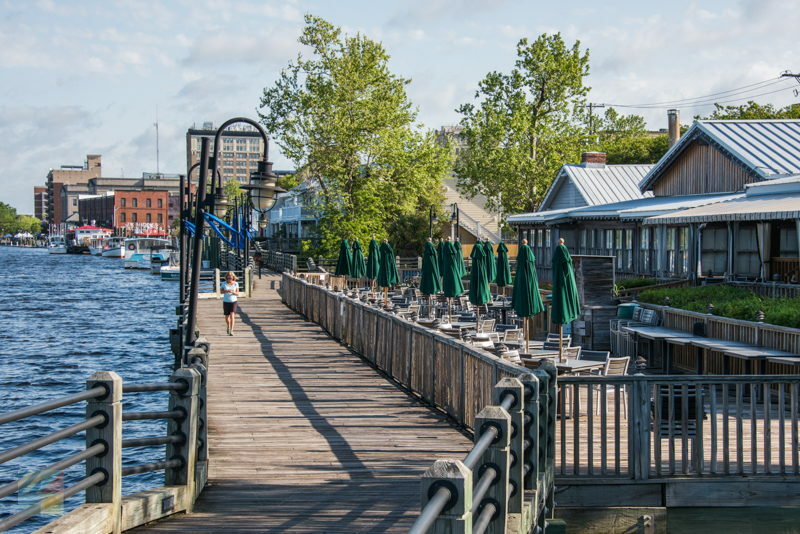 The Wilmington Riverwalk is close to dozens of area restaurants, thanks to its locale in the heart of downtown Wilmington. 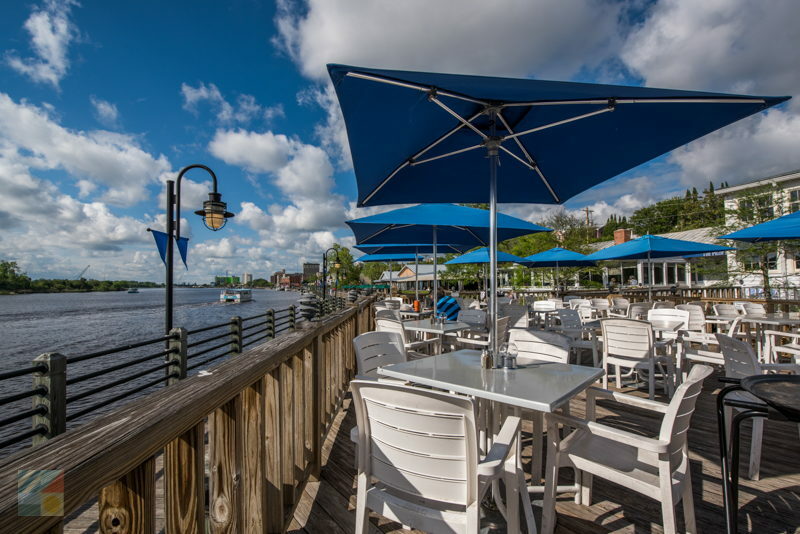 These eateries include a number of local restaurants or pubs with outdoor seating that are situated on the edge of the Wilmington Riverwalk. Are there shops near the Wilmington Riverwalk? The Wilmington Riverwalk is located less than a block away from a myriad of shops that are in the downtown Wilmington region, and which can be found by exploring Water Street and Front Street, just off the Wilmington Riverwalk. Can you jog on the Wilmington Riverwalk? The Wilmington Riverwalk is open for joggers and runners, although visitors should note that the Riverwalk can get a little crowded with pedestrians on warm weekends, and during the middle of the day. Are pets allowed on the Wilmington Riverwalk? Dogs are allowed on the Wilmington Riverwalk and throughout downtown Wilmington, provided they are on a leash at all times. Can you bike on the Wilmington Riverwalk? While cycling on the Wilmington Riverwalk is technically allowed, it is not recommended due to the heavy pedestrian traffic. How close is the Wilmington Riverwalk to the water? The Wilmington Riverwalk literally marks the border of the Cape Fear River, and it follows the river throughout its 1.75 mile length. Can you fish off the Wilmington Riverwalk? Fishing is not allowed along the Wilmington Riverwalk, or from the Riverfront Park, which is located along the walkway. Are there events on the Wilmington Riverwalk? The Wilmington Riverwalk is the site of a wide array of events, especially at the centrally located Riverfront Park. Popular events throughout the year include art and craft shows, live music concerts, and a weekly farmers’ market on Saturdays. 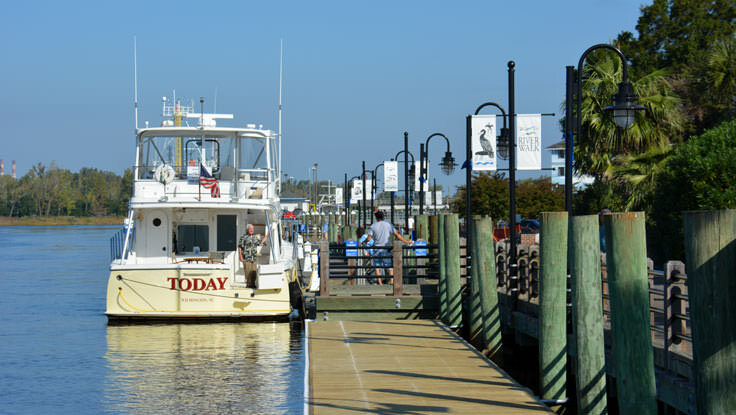 Are there marinas along the Wilmington Riverwalk? 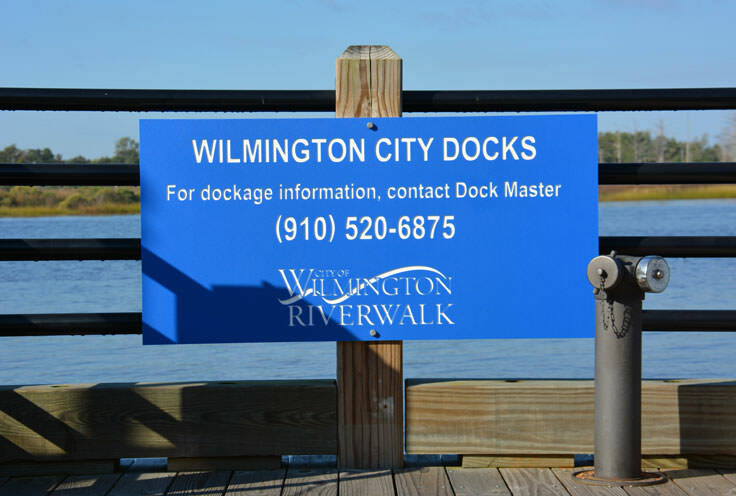 There are a number of privately owned marinas that are either along the 1.75 mile long Wilmington Riverwalk, or which are within easy walking distance. Transient slips and docking may be available for mariners who want to visit Wilmington, depending on the individual business. Where can you park to explore the Wilmington Riverwalk? There are a number of parking areas in the downtown Wilmington area that provide easy access to the Wilmington Riverwalk. One of the largest public parking areas is situated close to the Wilmington Convention Center, and there are also a number of parking garages or lots located along 2nd Street and Water Street. In addition, there is street side parking throughout the downtown area of Wilmington. Does it cost money to walk on the Wilmington Riverwalk? The Wilmington Riverwalk is free and open to the public, however, there may be a fee to park in the downtown area. Are there tours of the Wilmington Riverwalk? Tours that cover portions or all of the Wilmington Riverwalk may be available for visitors. Tour varieties can include downtown trolley tours, horse-drawn carriage tours, bike tours, and walking tours. 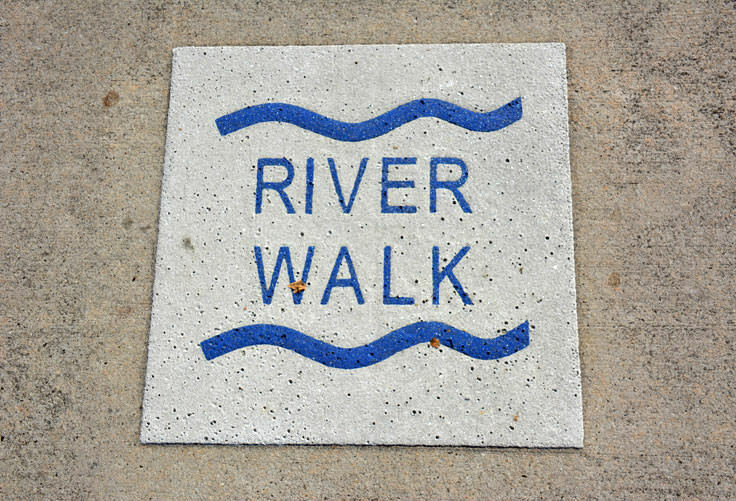 How long does it take to walk the entire Wilmington Riverwalk? Because the Wilmington Riverwalk is 1.75 miles long in total, it takes roughly an hour to walk the entire Riverwalk at a leisurely pace from one end to the other. Is the Wilmington Riverwalk lighted at night? The Wilmington Riverwalk is lighted at night, and streetlamps are located all along the walkway. Does the Wilmington Riverwalk close at night? The Wilmington Riverwalk is open to visitors 24 hours a day, year round. Why is the Wilmington Riverwalk special? 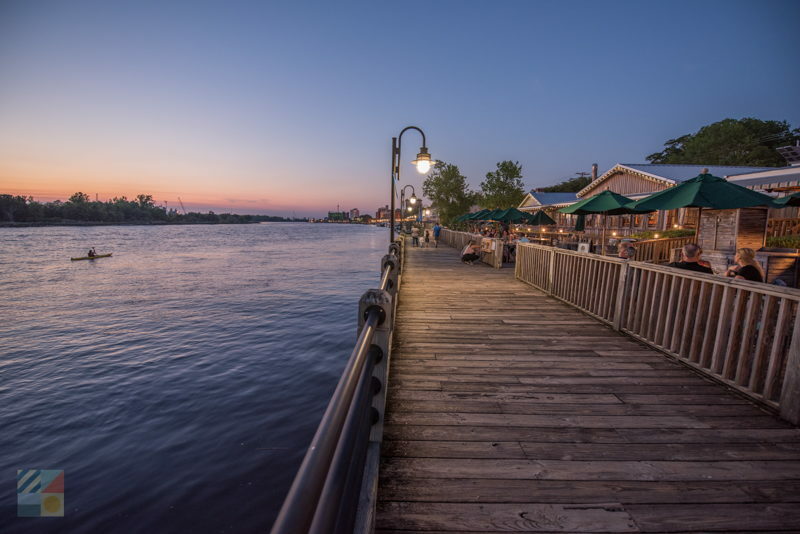 A project that was decades in the making, the Wilmington Riverwalk has become downtown Wilmington’s #1 attraction, according to the City of Wilmington, and it provides easy access to area parks, landmarks, dining, shopping and attractions. The Riverwalk connects with the River to the Sea Bikeway, the EastCoast Greenway and the Cape Fear Historic (Scenic) Byway, and was named the Top Riverfront in USA Today in 2015.